NASA’s Kepler space telescope has discovered three planets that may be able to support life, while one of them is the most earth-like world spotted to date, scientists say. Two exoplanets have been discovered in their stars’ habitable zones, what is known as just the right range of distance where liquid water can exist on a planet’s surface. Kepler-62f is a rocky world 1.4 times bigger than earth and circles a star smaller and dimmer than the sun. Its neighbor, Kepler-62e, is just 1.6 times larger than Earth. Both are the smallest exoplanets ever found in their stars’ habitable zones. Both Kepler-62e and f, “look very good as possibilities for looking for life,” said Bill Borucki, the Kepler science principal investigator, of NASA’s Ames Research Center in Moffet Field, California. The third potential earth-like planet identified by the scientists is Kepler-69c, standing at 1.7 times bigger than Earth and orbits a star similar to our own sun. Boruchi said it represents a big step towards finding the first ever “alien earth”. “We’re moving very rapidly towards finding an Earth analogue around a star like the sun,” Borucki told SPACE.com. Kepler-69c lies 2,700 light-years away in the Cyngus constellation. The Kelper-62 discovery paper, which is being led by Borucki, was published Thursday in the journal Science. The three potentially habitable worlds are part of a larger find. Scientists unveiled a total of seven new exoplanets, five in the Kepler-62 system and two in Kepler-69. The Kepler-62e system is located about 1,200 light years away from earth in the Lyra constellation. The five newfound planets range from 0.54 to1.95 times the size of earth, but only Kepler-62e and f are potentially habitable. Kepler-62e and f take 122 and 267 days respectively to complete an orbit around their star, which is reported to be only 20% as bright as our Sun. A separate modeling study of the two planets suggests they’re both water worlds totally covered by global oceans. “There may be life there, but could it be technology-based like ours? Life on these worlds would be under water with no easy access to metals, to electricity, or fire for metallurgy,” the lead author of the study, Lisa Kaltenegger, of the Harvard-Smithsonian Centre for Astrophysics and the Max Planck Institute for Astronomy, said in a statement. Researchers said that Kepler-62e should be warmer than its more distantly orbiting neighbor and may require a greenhouse effect to stop its ocean’s from freezing over. “Kepler-62e probably has a very cloudy sky and is warm and humid all the way to the polar regions. 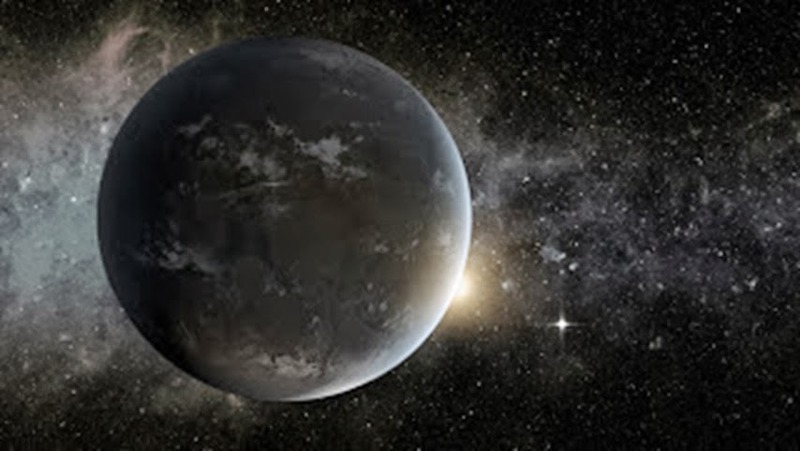 Kepler-62f would be cooler, but still potentially life-friendly,” co-author Dimitar Sasselov of Harvard said in statement. The $600 million Kepler observatory was launched in March 2009 to hunt for earth sized exoplanets. Kepler searches for planets by detecting tiny brightness dips when they cross the face of their stars. Kepler has spotted 2,700 planets since its March 2009 launch, while about 120 of these candidates have been confirmed to date. Borucki pointed out that Kepler is getting closer and closer to discovering earth’s twin, with Kepler-69c an example of how close. “I think we’re making excellent progress in that direction. We have a number of candidates that look good,” he said. While the Kepler cannot actually search for signs of life on the planets like 62e and 62f, the telescope is paving the way for future missions to do just that, he said. A super-Earth is an extrasolar planet with a mass higher than Earth's, but substantially below the mass of the Solar System's smaller gas giants Uranus and Neptune, which are both more or less 15 Earth masses. The term super-Earth refers only to the mass of the planet, and does not imply anything about the surface conditions or habitability. Astronomers at the European Southern Observatory in Chile found out that 40 per cent of red dwarves are orbited by super-Earths. Red Dwarfs are by far the most common type of star in the Milky Way galaxy, so there might be tens of billions of such planets in our galaxy alone.